Police in Horsham and Brighton are still searching for a teenager wanted on recall to prison. Joshua Rutigliano is wanted for recall after failing to comply with the conditions of his release licence. 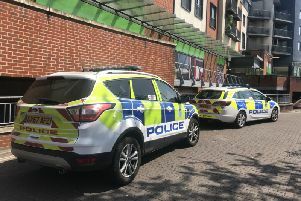 Police said the 19-year-old is also wanted for questioning in connection with a series of assaults in Brighton city centre in the early hours of June 26. An initial appeal to locate the teenager was issued by officers in August. He has still not been found. Police said Rutigliano was released from Rochester Prison on March 28 part way through a three-year sentence for attempted robbery.. He is described as white, 5’ 9”, of slim build, with dark brown hair and brown eyes. It is thought that he may have shaved his beard off since the warrant was issued, officers added. The teenager has lived at addresses in Horsham but also frequents Brighton and Hove. PC Ian Whitehouse said: “If you see Rutigliano, or know where he is, please contact us via 101 or online, quoting serial 578 of 05/07. A 21-year-old man was interviewed under caution and arrangements are being made to interview a third man in relation to the Brighton assaults. Police said Enquiries are continuing.